While many people refer to it as an apple brandy, pears are also allowed in Calvados. The Northern part of Calvados, particularly the appellation Pays d'Auge, has a softer soil more conducive to the shallow roots of apple trees. Nearly all Calvados from the Pays d'Auge is made with apples alone. The Lemorton FamilyIn contrast, the southern appellation of Calvados, the Domfrontais, has clay and limestone soil much more suited to the strong, deep roots of pear trees. Appellation law insists that at least 30% of the cider to be distilled in the Domfrontais is made from pears. This pear influence makes not only for a lighter-colored spirit, but also one which emits a more feminine and elegant bouquet. 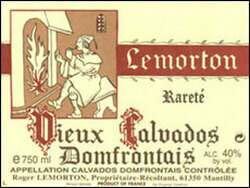 The Lemorton family has a long history in the Domfrontais. Roger (right) is the fifth generation and his son (Didier, left, with his son) now runs the domaine. Their 9-acre property is planted with both apple and pear trees; the latter's influence is dominant; for every three apples in their Calvados, there are approximately seven pears. The Lemortons distill their cider after aging it for eleven months in oak barrels. Distillation takes place in their own alambic, a single-distillation unit that distills to about 140 proof. The clear spirit then goes into barrels which have an average age of 30 years. The Lemortons sell some excellent young blends, including a five and 10-year-old. 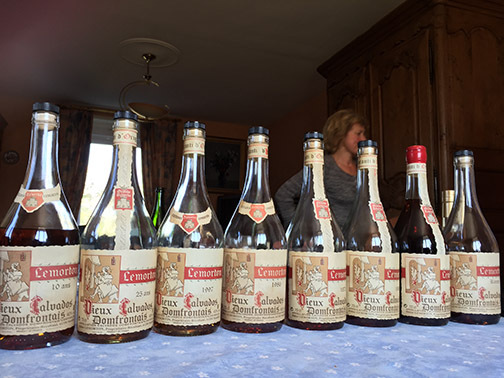 The jewels of the family crown, however, are the vintages from the 1970's. These are spirits which still retain their fruit while fully displaying their terroir and breed. Light pear aromas along with a touch of vanilla. Pear and floral notes on the nose and palate. Slightly richer texture with a bit more tannin and better length. The young pear notes are beginning to converge with rich apple flavors. Additional notes of flowers, almond and vanilla. Touch of pear skin and a wisp of woodsmoke on the finish. Smells rich, somewhere between apple and pear along with a toffee note. Complex nuances include licorice, almond, orange and woodsmoke.